The IEEE or the Institute of Electrical and Electronics Engineers is an organisation that confers many different awards. 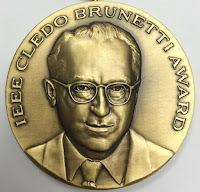 One of them is the IEEE Cledo Brunetti Award. Adding the known Wikipedia articles is easy, they have their Wikidata item, it is just a matter of linking the two. Making a complete list is not as easy. According to the article, the data from 1986 to 2001 is missing and, only one of the winners after 2001 is linked to an article. The missing data is available; it is on the official website in a PDF. It is easy to make a list of all the people who have been awarded this prize.